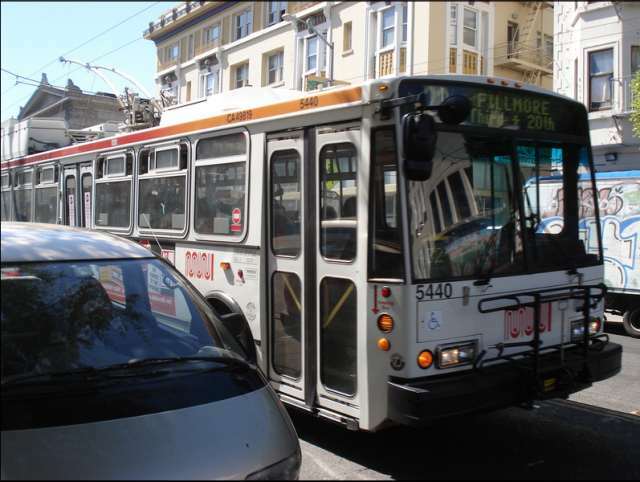 If you think the bus is so slow that you might as well be on foot, Motion Starved and Athleta on Fillmore Street are challenging you to put your theory to the test tomorrow in their “Race the 22-Fillmore” event. At 6 p.m., the runners are gathering at Fillmore and Cervantes to see if they can outrun the bus up and over the hill. At the end of the race, there will be free snacks waiting. Repeat: FREE SNACKS! As you might know, the average speed of Muni is 8.1 miles an hour (visualize that here). That translates to a brisk 7.4 minute/mile for you gym rats. Given how often I’ve personally outwalked the 49, I think the gym rats stand a pretty good chance … unless the bus driver decides to pull an reenactment of Speed, of course. Find event details over at FunCheap SF. Hey! Thanks for spreading the word! Hope to have lots of racers out there tomorrow. Remember, this is all in fun, not a comment on Muni Service.